There is a mandatory waiting period for mortgage loan borrowers to qualify for a residential mortgage loan after filing for Chapter 7 Bankruptcy. A Chapter 13 bankruptcy is a form of bankruptcy where the debtor asks the court for a repayment plan set up within a period of 3 to 5 years. Fannie Mae and/or Freddie Mac classifies deed in lieu of foreclosure and short sale different than a standard foreclosure. 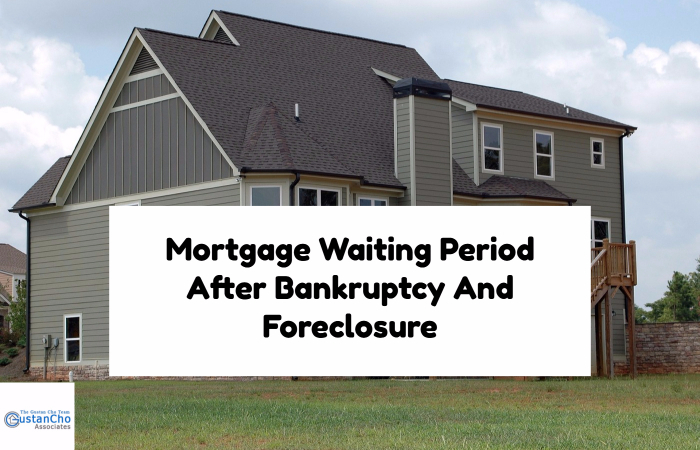 Mortgage Waiting Period After Bankruptcy And Foreclosure is different for short sale and deed in lieu of foreclosure than it is for regular foreclosure. The U.S. Department of Veteran Affairs (VA) is the government agency in charge of VA Loans. There is no waiting period after short sale to qualify for FHA Loans if the borrower was timely on all of their mortgage payments up to date of the short sale. USDA Guidelines on Mortgage Waiting Period After Bankruptcy And Foreclosure is the same as those of HUD Guidelines. USDA Rural Development normally has a three year mandatory waiting period after a short sale in order for the mortgage loan borrower to qualify for a USDA Rural Development mortgage loan. UPDATE: The FHA Back To Work Due To An Extenuating Event Mortgage Program no longer exists and has been discontinued. Gustan Cho Associates will leave the FHA Back To Work Blogs published for its archives. Effective August 15, 2013, the new waiting period after a bankruptcy and/or foreclosure will be one year under the FHA Back To Work Extenuating Circumstances Due To An Economic Event Mortgage Program. The FHA Back To Work Program has been discontinued.